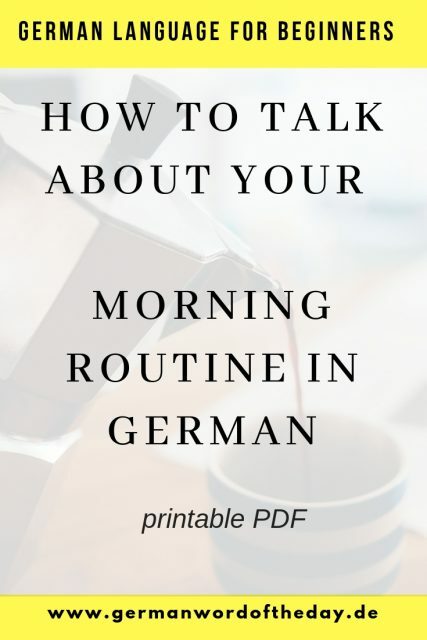 Talking about your daily routine is one of the best topics to practice speaking German for beginners. You can use short and simple sentences and basic grammar to talk about your day in German. On the other hand, there are some unusual verbs that you need use to describe your morning routine. These verbs are important to learn because they are used quite often in the German language. Practice them with a simple topic like your daily routine and you will soon notice how your grammar improves. 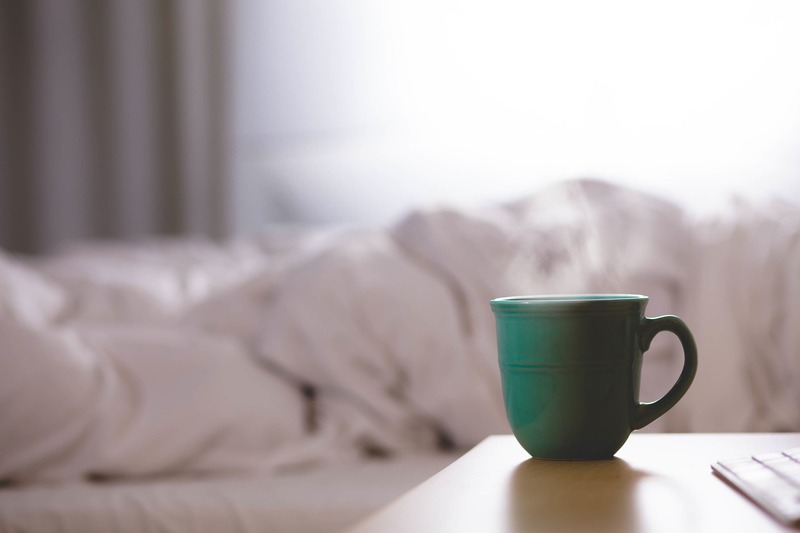 Let’s look at two categories of unusual German verbs that you can use to describe your morning routine. The verbs in the first category are the reflexive verbs (Reflexive Verben). Reflexive verbs act on the subject itself, so the pronoun refers to the subject of the sentence. When you look up verbs in the German dictionary, you will notice that some of them include the word sich which means oneself. For example, sich anziehen – to dress oneself, sich schminken – to put on makeup. Some German reflexive verbs are equivalent to the English reflexive verbs and require the reflexive pronoun where English also does. For example, Ich wasche mich. – I am washing myself. Ich schminke mich. – I am putting on makeup. Ich rasiere mich. – I am shaving. Ich ziehe mich an. – I am getting dressed. Reflexive pronoun sich can be used in accusative or dative form. But we will keep it simple and only look at accusative for now. Another set of unusual German verbs includes verbs with separable prefixes (Trennbare Verben). They are similar to English verbs that consist of two parts like get up – aufstehen, wake up – aufwachen. German prefixes change the meaning of the verbs totally or partially. Compare stehen(to stand) – aufstehen(to get up), geben(to give) – aufgeben(to give up). Ich stehe um 8 Uhr auf. – I get up at 8 a.m.
Ich ziehe mich schnell an. – I dress quickly. However, if the verb is used in the infinitive form, the prefix is not separated: Ich muss früh aufstehen. – I have to get up early. Ich will nicht aufwachen. – I don’t want to wake up. 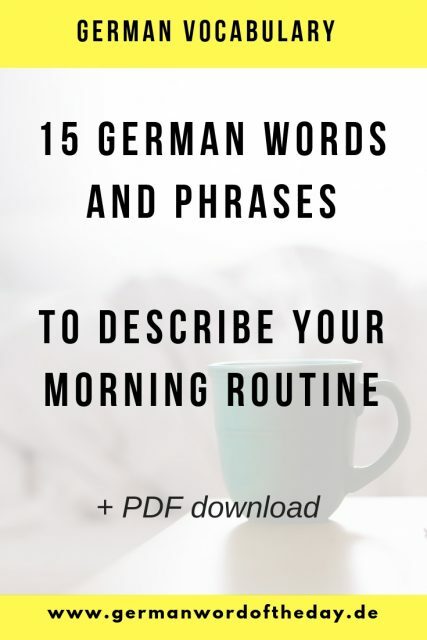 One more thing you need to know to talk about your morning routine in German is how to use time phrases. Ich stehe um 7 Uhr auf. Dann putze ich meine Zähne. Danach trinke ich Kaffee. And now take a look at useful words and phrases that you can use to describe your morning routine. Don’t forget to download the PDF to keep practicing later! um …. Uhr – at …. Here is an example of my mourning routine in German with English translation. Ich stehe jeden Tag um acht Uhr auf. Dann trinke ich ein Glas Wasser mit Zitrone und mache Yoga. Danach dusche ich und putze meine Zähne. Manchmal schminke ich mich. Dann esse ich Eier zum Frühstück und trinke Kaffee oder Tee. Danach ziehe ich mich an und gehe um 9 Uhr zur Arbeit. I get up at eight every day. Then I drink a glass of water with lemon and do yoga. Then I shower and brush my teeth. Sometimes I put on makeup. Then I eat eggs for breakfast and drink coffee or tea. Then I get dressed and go to work at 9 o’clock. Wie sieht deine Morgenroutine aus? What does your morning routine look like? Write in the comments below! I wanted to comment on the article of the morning routine but somehow seems like comments may be disabled. So I will write my own morning routine here. Ich stehe um fünf Uhr auf. Zuerst bete ich, und danach putze ich mir die Zähne. Ich düsche mich und ziehe mich an. Ich trinke ein Glas Wasser und esse Obst. Nach dem fühstück räume ich meine Zimmer auf und dann um sechs Uhr, gehe ich zur Arbeit. Ich fange meine Arbeit um sechs Uhr an. und dann um sechs Uhr, gehe ich zur Arbeit. = und dann gehe ich um sechs Uhr zur Arbeit. Von Samstag bis Donnerstag stehe ich um 9Uhr auf. Dann trinke ich Tee ohne Zucker. Dann frühstücke ich fast immer reis mit spiegelei. Danach dusche ich und putze ich meine Zähne. Dann ziehe ich mich an und dannach gehe ich zur Arbeit.